My friend Christie has started a wonderful series on her blog called "How-To Tuesday." Click over and read today's and all other previous posts, you'll learn all sorts of helpful things from Christie and the rest of the "How-To Tuesday" gang. So, I'm sort of cheating with this offering since it's also part of my regular "We Love Washington, DC" series, but I thought, why not kill two birds with one stone. Also, I recognize that some cities lend themselves more naturally to this sort of thing, but I know that every locale has something to offer its residents, even those where you've lived for what feels like forever. Step 1. Make a plan. Advance planning is critical, especially if you have young children. If you are lucky, you live in an area with lots of attractions and lots of resources for figuring out what's happening when and where. Like this site that I read religiously: KidFriendly DC. But, even if you live in smaller cities or towns there is usually a calendar of events available at the local library, chamber of commerce or community center listing happenings you probably have never even considered attending, much less knew existed. Step 2: Decide your route. We opted for public transportation for our most recent outing because 1) the kids love to ride the Metro; 2) finding parking in DC is often frustrating and always time-consuming; and 3) tourists almost always get around using the Metro, and we were trying to blend in. Step 3: Choose age appropriate activities. 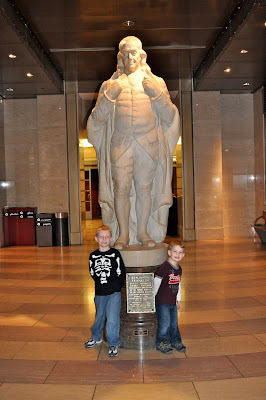 Our outing was to the National Postal Museum. Very kid-friendly, but also interesting for adults, too. Remember your audience when you make your plan or no one will have fun. And, talk it up, whatever "it" is. Even a trip to the local bakery can be exciting if you couch it that way. In smaller communities, try calling ahead and see if you can get a behind the scenes tour. Local business owners are often only too happy to let you come behind the counter and check out their operation up close and personal. Step 4: Think about timing and proximity. My kids are good for about 1 - 2 hours at museums. We know that and have to work around their needs or we would never go anywhere. Also, they get hungry at lunch time, like every other child on the planet. The National Postal Museum is across the street from Union Station, which has endless food options, so we planned to end our day with lunch. And, we told them the plan in advance (i.e 1) Take the metro, 2) Go to the museum, 3) Get lunch) so they were aware of what was coming next. Communicating with everyone is critical to a successful day of tourism, whether you're at home or on vacation. Having a plan does not diminish the spontaneity of the trip, in fact, in my experience it actually enhances everyone's level of enjoyment. Step 5: Don't forget your camera. Even if you're not a photographer, "tourist" outings always provide unexpected photo ops, like this one with an enormous statue of Benjamin Franklin. Step 6: Don't be shy. There will always be someone willing to take your picture. Ask them, you'll be glad you did. Also, ask questions. The volunteers in places where tourists frequent are usually really knowledgeable and seldom called upon to impart anything other than the way to the bathrooms. And, if your kids are not always willing to let you read all the signs, this is a great way to find out fun facts you might otherwise miss. The next few pictures are of the various modes of transportation employed by the Post Office for mail delivery over the years. The boys loved the indoor trucks, trains and planes. Step 7: Be flexible and have fun. You never know what undiscovered adventures you're going to happen upon in your touristing, so try everything. I keep a running list of must see and off the beaten path destinations that I refer to any time we have time for an outing. It's always a pity when you waste half the morning devising a plan. Step 8: Do it. There is always something to do, you just have to your homework and then go for it. Yay! I'm so happy you played along! This is a great post. I am so jealous of where you live. SO MUCH TO DO. Awesome tips, too. Thanks for sharing! Your so GREAT about planning activities for your kids. You get an A+ in mothering! The Weekly State Department Blog Round-up is posted, and you're on it! http://whaleears.blogspot.com/2011/03/artsy-crafty-round-up.html. If I've made any errors, or you prefer not to be included, just let me know. Thank you! You've inspired me and we've actually participated in a ton of activities recently, I'm just too lazy to blog about them...and az isn't as cool as dc. Hi, Linsey - I'm here because Travelin' Oma linked your blog from her's. She said to say "Hi". I grew up in suburban No. Virginia. My parents rarely took us into DC just to do tourist stuff We only went if relatives came in to town (which was rare) or on a school field trip. Back in my DC days, there was no Metro. My grandkids love to ride TRAX in SLC and I often do tourist like things with them here.